This database called MEW (Middle European Woods) was originally with name LEAF created for experiments with recognition of wood species based on a leaf shape (see Recognition of woods by shape of the leaf). It contains leaves of wood species growing in the Czech Republic, both trees and bushes; native, invasive and imported (only those imported species which are common in parks are included). The leaves were scanned with 300 dpi, thresholded (binarized) , preprocessed (denoising and cleaning) and saved in PNG format. The name of each file includes the latin name of the species and the label of the sample. The version 2010 has 90 species. The number of samples (leaves) of one species varies from 2 to 25, their total number in the database is 795. The version 2012 has 153 species. The number of samples (leaves) of one species varies from 50 to 99, their total number in the database is 9745. The version 2014 has 200 species. The number of samples (leaves) of one species varies from 4 to 168, their total number in the database is 15074. The versions 2012 and 2014 can be downloaded from here). The database can be used for any experiment with binary images. For non-profit and education purposes, it can be used free of charge. For the conditions of commercial usage, please contact Jan Flusser (flusser@utia.cas.cz). 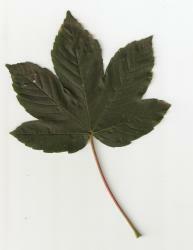 An example - a leaf of "Acer pseudoplatanus" in Latin, "Sycamore maple" in English, "javor klen" in Czech, sample No. 50. Version MEW 2010 can be downloaded from here. The file 'list of species.txt' contains the list of species. The number after the semicolon is the number of samples of the current species. The file 'Acces to image files.m' is MATLAB m-file with the code for the acces to the image files.